Solar generator systems ensure that you’ll be able to maintain access to power in the event of an emergency situation or disaster. In this guide we’ve covered the best solar panels, portable solar generators, and survival solar products to make sure that your electricity supply remains uninterrupted, wherever you are and whatever the situation. The best solar generators and solar panel systems allow you to harness the power of the sun when the usual power supply simply can’t be relied on. 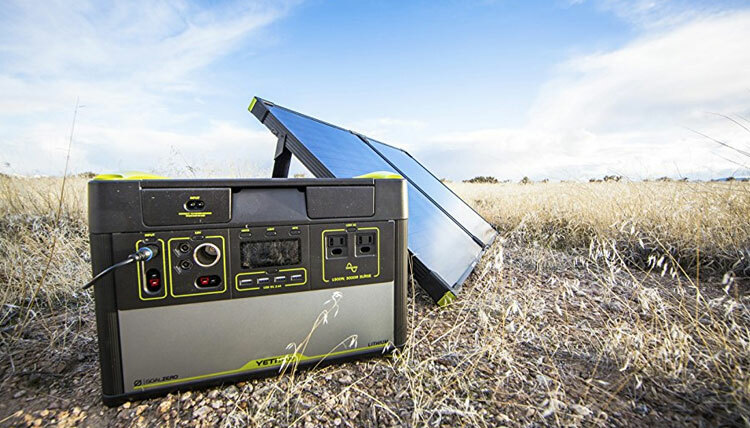 Whether we’re talking about the aftermath of a man-made or natural disaster leading to a blackout or power outage at home, or simply being able to generate energy off-the grid, on the road, or in a back country location, a portable solar generator system is an instant go-to energy solution for power contingency that just requires clear skies to get you back up and running. Solar generators represent the best silent, gas free generator alternative and mean that if you’ve got access to sunlight, you’re going to have access to power. 1 What are Solar Generators? At the simplest level, while the term ‘solar generator’ is often used to refer to a single, portable portable power unit, for practical purposes you really want to think of solar generators as a couple of devices – a base unit for storing and dispersing power (the ‘generator’) and the solar panels which actually capture the sunlight. Both of these main elements combine to form a single power generating and storing system which can be called on in times of need. The best solar generator systems are designed to capture the energy of the sun via a solar panel or an array of panels connected together, before storing this captured energy in a battery, and then releasing it as practical and usable power through an inverter to run electrical items as and where needed. It’s this battery and inverter unit which is typically thought of when we talk about a solar generator but whichever way you cut it, you’re not getting any solar captured power out of the thing unless it’s connected to a solar panel or array of panels. With the captured juice stored in the battery, you’re then going to have access to a source of power that (depending on the specs of the solar generator you choose), can be used to power anything from lights and laptops, to refrigerators and televisions before the battery runs dry and you need to collect the next batch of solar energy. In a nutshell, a solar generator kit is the complete set of equipment – from solar panels to battery systems – that you need to get you up and running on solar power. As you may or may not already know, the traditional alternative to providing this kind of backup power if the grid fails (or isn’t accessible) usually comes in the form of some kind of gas powered generator. While there’s absolutely a case for gas generators as well – particularly given their cost effectiveness and efficiency in certain use cases – if you’re after the kinds of unique benefits offered by the best solar generator systems, you’re certainly not going to find them from more conventional backup generator systems. The first of the major advantages of a portable solar generator is the ability to generate power silently – a critical consideration if you’re looking to maintain a low profile while still keeping access to power in an emergency situation. Secondly, solar generators aren’t going to be producing fumes when you operate them unlike their gas powered siblings. This of course means that once you’ve harvested your sunlight, that portable battery pack holding your captured energy can come indoors and be moved around where it’s needed most. The best solar generator kits contain everything you need (minus the sunlight) to begin collecting, storing, and using solar energy whether you’re at home or on the road. These kits typically include a solar panel or array of panels and a portable base unit which is used to store and dispense the collected energy when needed. If you’re new to the world of solar generators and are looking for the best out of the box and cost effective solution for quickly building a solar powered redundancy into your preparedness planning, going for a portable solar generator kit is absolutely one of the best options to get you there as soon as possible. The best solar generator kits vary in price point and the system you choose will ultimately determine a whole load of factors from how quickly (and efficiently) you’re going to be able to harvest solar energy from sunlight, through to the storage capacity of the battery (how much energy you can store at a time), and the output of the device when it comes to running appliances or devices on the other side once you’re hooked up. With this in mind, it’s a good idea to think about what you’re looking to get out of a solar generator before making a choice and then balancing this alongside your budget and any practical considerations (will this be used at home or need to be portable for example). Armed with this information, you’re going to be in a good place to make a decision about how much you’re looking to spend, and what kinds of objectives the system needs to meet for your specific situation and potential use scenario. We’ve picked out the very best solar generator kits on the market today and have covered a wide range of the top models and systems to help you make an informed decision on the solar generation setup that’s going to best meet your needs. The best solar generators in this range are going to serve you well if you’re looking for a renewable power solution that will run small to medium size electrical devices and appliances. For portable solar generator systems within this price bracket, expect to be able to power devices such as laptops, tablets, phones, lights, and other appliances with a similar energy requirement. If you’re looking for the best solar generator kits for powering larger appliances around the home or on the road, skip ahead to the section on Mid Range Output and High Output Solar Generator Kits later on in the guide. Combining the excellent Yeti 400 Lithium Power Plant with the versatile Nomad 28 Plus Solar Panel, this solar generator kit contains everything you need to power up to 7 small devices as soon as you’re set up. The Yeti 400 is the 428Wh lithium portable power station that makes up the power storage and output element of this kit and allows you to power up to 7 devices at once (39,600mAh at 10.8V/119,000 at 3.6V). This solar generator kit is designed for low power users who are looking for solar power solution that’s both lightweight and portable, and that can quickly kick into action if the grid goes down. What this means in practice is that this portable solar generator setup is going to be ideal for charging most small devices and will have no problem powering phones, tablets, laptops, cameras as well as small household appliances and lights. 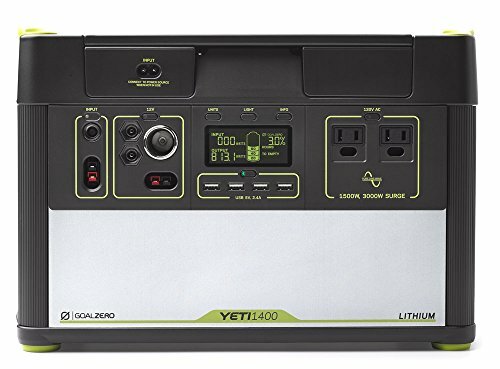 In terms of performance and feature set, the Yeti 400 power plant utilizes a continuous 300W, 1200W surge pure-sine wave inverter and includes 2.4A USB ports and 120W 12V ports for output to a range of compatible electrical devices and appliances. The Nomad 28 Plus represents the solar panel component of the Goal Zero kit and when setup in sunlight, will fully charge the Yeti 400’s lithium battery from empty in around 20 hours. On top of this, you can also directly connect and charge your USB powered devices from the sun making this a great option if you’re in an area away from any form of electrical supply but still need access to power for your small devices or appliances. Built around the excellent GO Mini backup power system, this portable solar generator kit from Humless delivers a complete portable energy solution that’s gas, emission, and noise free from the moment you set it up. 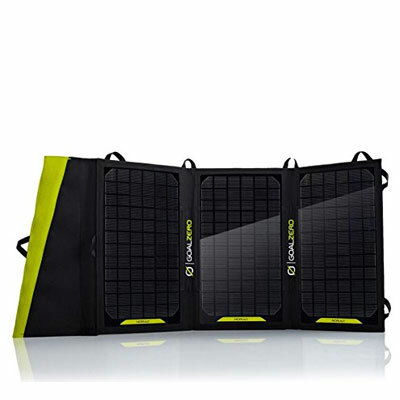 Solar energy collection is handled by two foldable 130 watt solar panels, the Go Mini with 0.64 kW (640 Watt) of power storage, and the plug-and-play connecting cable. The Humless Go Mini Solar Generator and Panel Kit contains everything needed to charge on the go with a continual supply of power. With this solar generator kit you’re looking at a portable power solution that’s been designed to operate from a minimal footprint for quick relocation and use wherever needed. 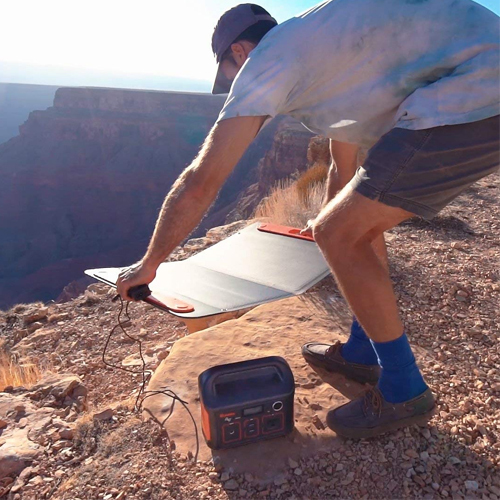 The GO Mini represents the power plant in this portable solar generator kit and comes in at a weight of just 34 pounds while measuring around 9 x 9 x 14 inches, meaning it’s perfectly sized for going off-grid, packing in a vehicle, or storing at home until needed. Two foldable 130 watt solar panels mean that when it comes to solar collection stats, the Humless kit is both capable and portable – the crucial combination you want to be looking for in a portable solar generator kit. When it comes to finding the best solar generator kit for your specific requirements, the general rule of thumb is that you’re going to capture, store, and ultimately have access to more energy as you begin to scale your solar generator devices (panels and batteries) up in size. This rule will almost always hold true whether we’re talking about the best solar generators and batteries or the best solar panels – in the first instance, you’ve got more physical space for storage capacity and in the second, more surface area for collecting more sunlight. With this in mind, the kind of solar generator kit you eventually settle on will be determined around these factors when it comes to your specific needs, and as useful as it may be in a survival situation, you’re never going to be able power a refrigerator from a backpack solar panel and pocket-sized powerbank! Luckily, the best solar generator kits in what we class as the ‘mid range’ category are going to offer you something pretty optimal here, particularly when it comes to striking that balance between capacity and power output and actual physical footprint. These portable solar generator kits are going to serve you well if you’re looking for a system that’s still small enough to relocate and move around when necessary (including packing in a larger car or vehicle), but are going to deliver a sufficient level of power to let you run larger devices and appliances in the event of a power outage situation. This solar generator kit captures and stores enough energy to power up a range of devices from small items such as phones, laptops, and lights, through to higher consumption appliances like fridges and power tools. 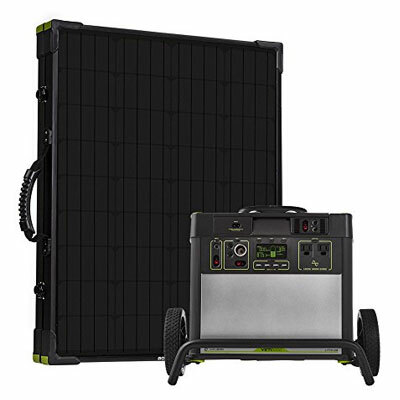 Utilizing the Goal Zero Yeti 1400 Lithium Portable Power Station means this solar generator combination offers an ultra-high-capacity electric generator that delivers highly portable power wherever and whenever you need it. 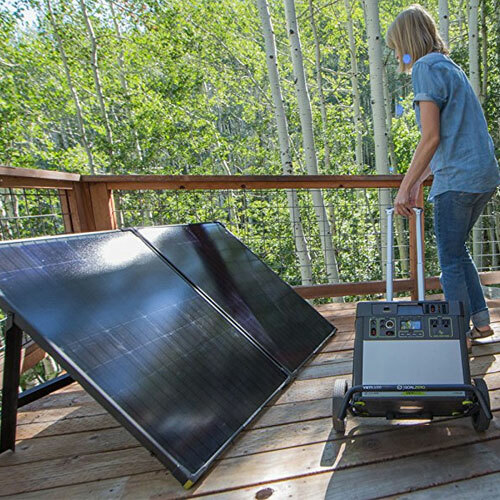 The inclusion of the awesome Boulder 100 Briefcase Solar Panel system means that this solar generator kit is incredibly easy to move around both in terms of the solar collection element and the power plant unit itself. 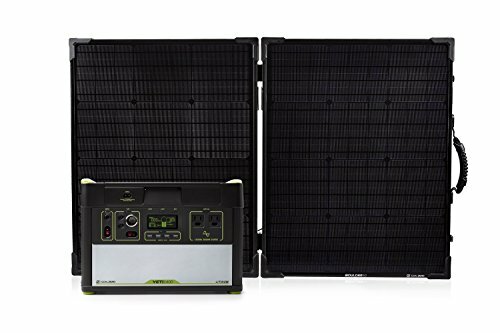 In an actual usage situation, what this means is that you’re going to be able to move both panels and battery around wherever and whenever needed with a lot fewer headaches, making this a solid choice as one of the best solar generator kit solutions for use as a home preparedness contingency or in a bug out vehicle. Getting started with this kit couldn’t be easier, simply plug the Boulder 100 Solar Panel Briefcase directly into Yeti 1400 Lithium Power Plant and you’re ready to start collecting and storing power for use when needed. Power storage in this portable solar generator kit comes from the excellent Yeti 1400 battery-powered generator. This unit provides a clean and quiet alternative to conventional 2000W gas-powered generators, utilizing an inverter that produces a comparable continuous output of 1500W, and almost twice this in surge capability 3000W, both of which you’re going to want for running high-power devices like refrigerators and other large household appliances. The Yeti 1400 offers a 1425 watt-hour capacity with a variety of high-power AC, USB, and 12V outputs on the device itself which mean it’s capable of running up to 10 connected devices simultaneously. In terms of the solar collection capabilities of this kit, the Boulder 100 Solar Panel Briefcase is a great partner for the Yeti 1400, allowing a highly portable solar panel system totaling 100 watts of highly-efficient monocrystalline solar cells. When it’s at full capacity, the Yeti 1400 is able to hold a charge for up to 10-12 months which means you’ve got a ready to go emergency power source that you can keep on hand to call on instantly if things go dark. 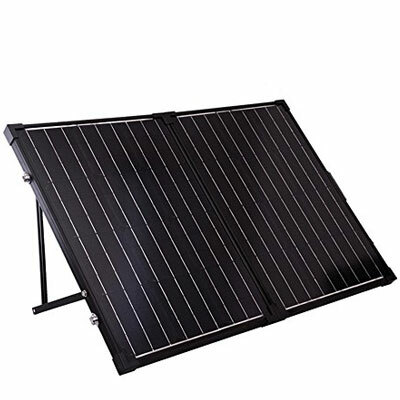 A rigid aluminum frame makes for an inherent lightweight yet tough construction and means this PV panel solution is a natural choice for chasing the best sun, moving around a plot of land at home or taking off-grid when camping or in a bug out scenario. What makes the Boulder 100 even better is that it can be chained with other compatible solar panels in an array of devices to reduce the recharge times. If you’re trying to find the best solar generator kit for use at home that will serve you reliably in running larger devices and appliances as well as items such as medical equipment, then you’re going to want a portable solar generator kit with a higher output capacity at it’s core. The best solar generator kits in this category are primarily intended for use at home or in a situation where the mobility of the power generator unit itself is not a priority consideration. You’re still going to be able to move the solar panels in these kits as and when required in order to capture optimal sunlight but for the power plant itself, you’re either going to want to store in a static location, or if the kit doesn’t come with one (and many do), you’ll want to invest in a trolley or cart to help you move the generator unit around when required. The solar generator kits in this part of the guide our the ideal solution for a home preparedness backup energy solution where the priority is on the resumption of power for mid-high consumption devices in the event of a blackout, power outage, or other similar emergency situation where reliability and power output are the number one consideration. This solar generator kit is comprised of the excellent Yeti 3000 Lithium power generator unit and the Boulder 200 Briefcase solar panel. Providing over 3000Wh/280Ah of lightweight lithium battery capacity, the Yeti 3000 power plant in this kit offers excellent runtimes and shelf-life, and even comes with a roll cart to help move the unit around where needed. 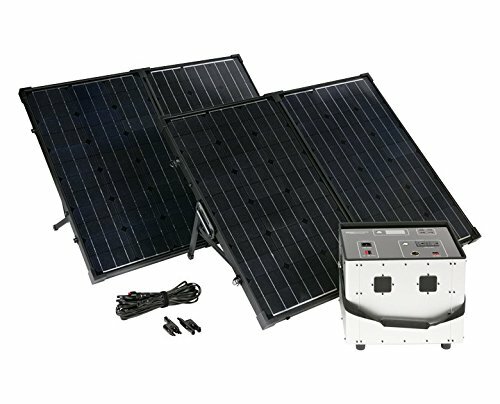 The solar collection element of this generator kit comes in the form of the Boulder 200 Briefcase solar panel which can be set up in either a temporary or permanent configuration, offering the ease to carry around when required, as well as an integrated kickstand which allows you to line it up for the best possible angle with the sun. This solution is one of the best solar generator kits out there if you’re looking for a high capacity and output system that’s powerful enough to operate as a comprehensive home backup generator, while still incorporating essential portability considerations and design features usually reserved for much smaller devices. At the center of this portable solar generator kit sits the Goal Zero Yeti 3000 power plant, a unit with high performance and output built in which utilizes a lithium battery of high quality cells which are long lasting, stable, and lightweight. As with all of the best solar generators out there, the Yeti 3000 is going to deliver a highly reliable power output without the noise, fumes, and maintenance often associated with gas generators. The main outputs of the Yeti 3000 include USB, 12V, and a multi-stage pure-sine wave AC inverter with the ability to provide 1500w continuous and 3000w surge. As with any solar generator power unit or battery system, with a larger capacity and output, you’re undoubtedly looking at a larger physical footprint in terms of both size and weight. The great news with the Yeti 3000 in this solar generator kit is that it comes bundled with the ‘Yeti Roll Car’, a 2-wheeled cart for transporting the generator to where you need it most. Not only does this mean that you’re going to be able to wheel the power unit around your home in an emergency situation, but it also means that you’re going to be able to get in the back of a vehicle if the situation means you need to head elsewhere for safety (a serious benefit also offered by the ‘briefcase’ style of solar panels in this kit which make them equally portable). 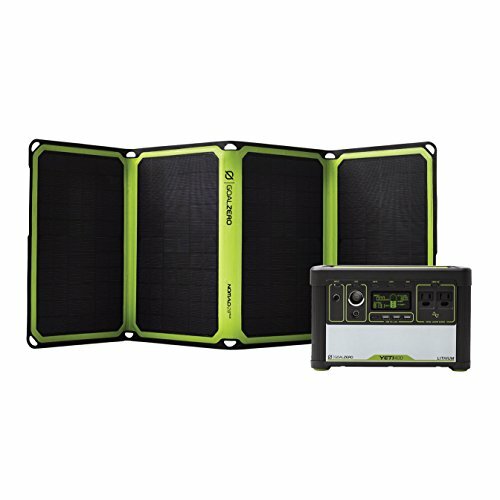 When it comes to the task of collecting the solar energy to charge your power plant (and ultimately, to power your devices), the Boulder 200 panels included in this kit are constructed from strong tempered glass alongside an aluminum frame, both of which provide the ideal combination of lightweight strength and durability for outdoor use in a range of scenarios. Once fully setup with Boulder 200 solar panels, this portable solar generator system is able to recharge in as little as 9 hours depending on the solar conditions and solar panel array, while the inclusion of two AC outlet wall chargers allows the Yeti 3000 power unit to charge from the wall in around 25 hours. This system represents a great option for a home preparedness solar generator, delivering power to devices from phones to fridges with the Yeti 3000 able to keep the latter running for up to 50 hours on a full charge should the grid go down. A solar generator power unit doesn’t have to be bought as part of a pre-bundled kit with panels and whether you already own solar panels or are looking at models outside of those included in a preconfigured kit, there are any number of reasons why you may decide it’s preferable to pick up a generator power plant separately. In these instances you’re going to find a lot of variety out there when it comes down to settling on the best solar generator power unit for your needs and with this in mind, we’ve pulled together the top solar generators currently available on the market to help you make an informed decision and get up and running as soon as possible. Remember, these power plant units are only 50% of the solar power generating equation though and won’t work without the addition of that most crucial component – the solar panels themselves. If you already own panels compatible with a generator or are intending to buy your panels alongside the generator unit, then you’re good to go (in the latter case, see the section The Best Portable Solar Panels below for our top picks). If you’re looking to assemble a reliable solar generator system as part of a full home preparedness strategy, one of your best bets for maximum resilience is a high capacity generator unit for keeping larger appliances or more devices running when the usual energy source can’t be relied on. Generators in this category are going to be a good choice if you need to run larger appliances for a period of time or if you’re looking to run a number of devices from a single unit, delivering a greater output of total power than generators in the lower capacity bracket. As you’d expect, price and size/weight are going to scale accordingly with higher capacity solar generator units but the increased efficiency and mainstream production of highly efficient (and lightweight) lithium batteries represent an excellent combination of portability, performance, and value for money. 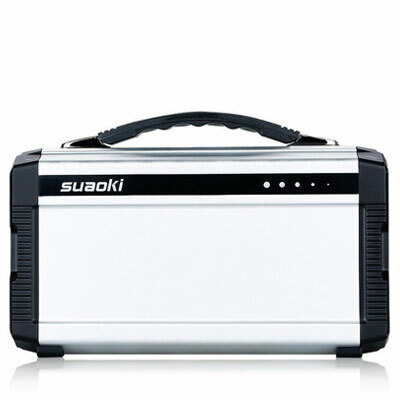 This portable solar power unit from Suaoki is designed to be charged from a range of sources including solar panels, AC outlets, and 12V/24V vehicle based power sockets. The Suaoki portable solar power generator operates quietly and produces zero-emissions while being easy and safe to use both indoors and outdoors. A combination of output ports on the unit includes 4 x USB ports, 2 x AC outlets, and 2 x 12V ports. The inclusion of a jump starter port for use in a roadside emergency makes this versatile solar charger unit the ideal companion for a bug out vehicle, allowing it to swap effortlessly between roles as required. An LCD display on the front of the unit provides an at a glance overview of the most important information regarding input and current capacity levels. 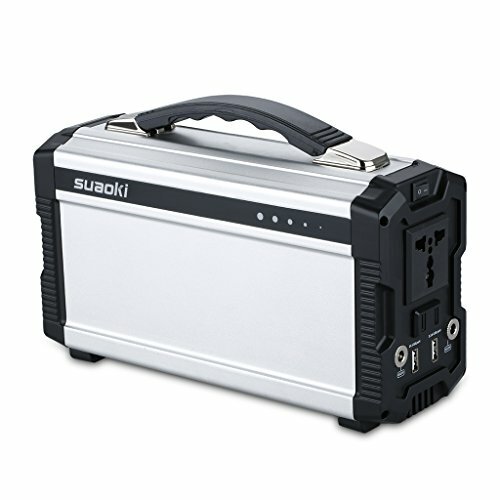 The Suaoki 400Wh/120,000mAh Portable Solar Generator is an excellent choice if you’re looking for a portable power unit that offers a wide range of input (charging) and output options in a solution that will serve you at home or on the road during an emergency. 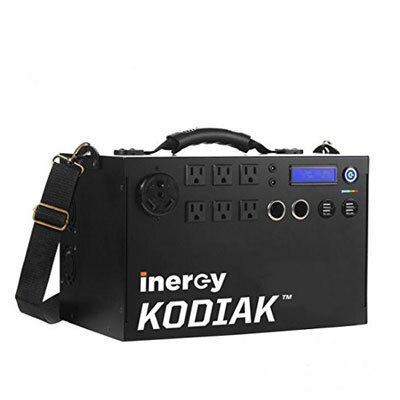 Weighing in at jut 20 lbs, the Inergy Kodiak is an ultra lightweight power bank unit designed for use as part of a comprehensive solar generator setup. 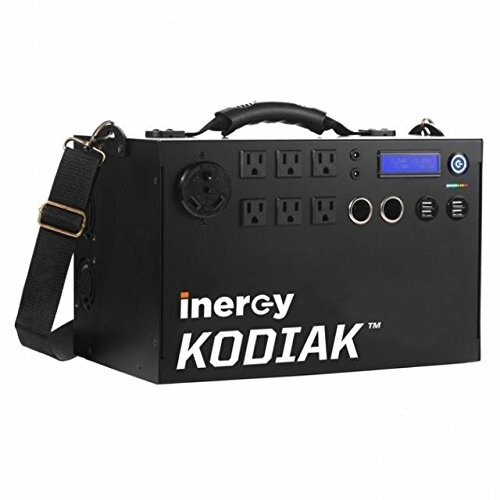 Offering a minimum charge time from an optimal solar panel arrangement of just 2.5 hours, the lithium ion battery that forms the power storage core of the Kodiak has a capacity of 1100 Watt hours (1100 Watt Continuous for 1 hour, 3000 Watt peak) and is rated for a life of around 2000 charge cycles. This portable solar generator power plant is an excellent choice if you’re looking for a power unit that’s lightweight, compact, and easy to move, while still maintaining high storage capacity and the ability to deliver considerable energy to devices and appliances when you need it most. The option to expand the capacity of the Kodiak with deep cycle lead batteries is also a significant benefit if you want to store more juice than the unit can handle out of the box and allows for a further level of energy resilience planning if required. Light enough to pack up in your vehicle and take off grid, yet powerful enough to serve you as an energy redundancy workhorse at home as part of your emergency preparedness strategy. The Yeti 1400 is a lithium battery-powered portable solar power station which is capable of powering up to 10 devices at a time without the fumes, noise, and fuel requirements of traditional gasoline generators. This ultra high capacity battery powered generator is designed to deliver energy to devices ranging from phones and lights, to fridges and power tools when the usual power sources aren’t available. Providing a clean and quiet alternative to a conventional 2000W gas powered inverter generator, the Yeti 1400 features an inverter capable of producing a similar continuous output (1500W), while providing almost double the surge capability making it perfect for running power hungry devices and appliances like refrigerators. At the center of this generator, is a stable, reliable, and energy-dense lithium battery setup which utilizes 18650 lithium cells chained into a high-capacity pack for optimal performance. In terms of output, the Yeti 1400 has a 1425 watt-hour capacity and outputs for USB and 12V, up to high-power AC, with the ability to run up to 10 devices simultaneously. When it comes to recharging, the Yeti 1400 can receive input power wall based power outlets or through connected solar panels and once fully charged, you can expect a shelf life of between 10-12 months for the stored energy. For outlet charging, the Yeti 1400 comes complete with an AC cable for recharging in around 25 hours. When connected with compatible solar panels to provide a full solar generator setup, you’re looking at a recharge time as quick as 4.5 hours based upon conditions and the setup of your solar array. 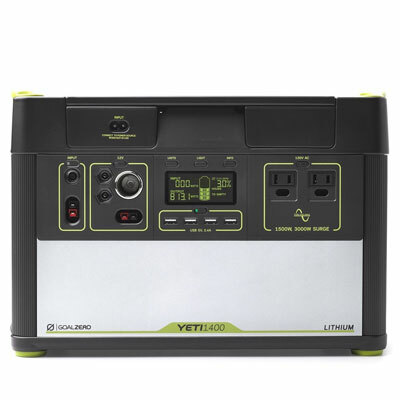 Similarly, when utilized as part of a portable solar generator kit or emergency solar power system, the Yeti 1400 is designed to allow pass-through power for simultaneous recharging from solar panels while in use on connected devices. 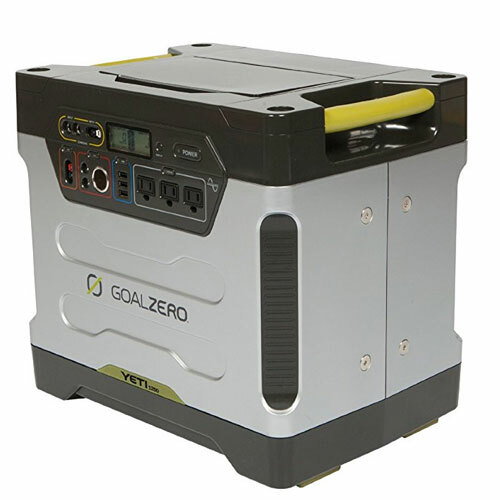 The Goal Zero Yeti 1250 is based around a 100Ah sealed lead-acid battery which is both rechargeable and replaceable. Recharging of the unit can be carried out in a number of ways ranging from 18 hours when plugged directly into a wall outlet and in as little as 6 hours when hooked up with a solar panel setup. 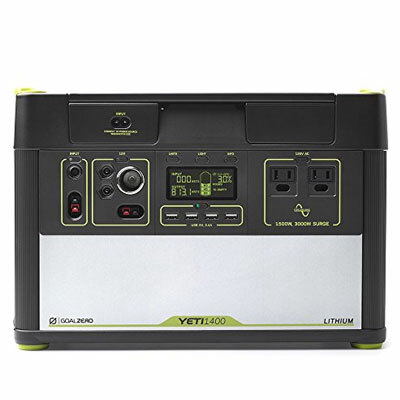 The Yeti 1250 is capable of powering up to 10 devices at once and can deliver energy to phones, laptops, lights, and tablets, while also serving as an emergency backup generator for appliances and most household devices. 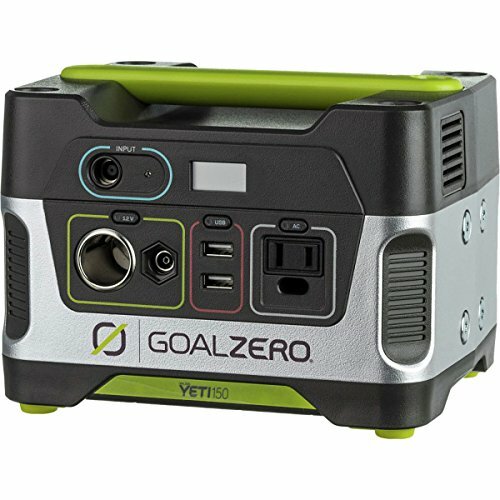 One of the unique features that Goal Zero bring in their charger units is ‘pass-through power’ which means that even while you’re connected to solar panels and charging, you can still power your devices through the Yeti at the same time. If you’re looking to get more runtime out of the device, the Yeti 1250 is chainable with other compatible 100Ah lead acid batteries to keep things going for longer. Backup power and solar generator systems aren’t reserved for solely running large appliances like refrigerators in a power outage or emergency. If you’re looking for a generator that will run smaller devices – think laptops, cell phones, and tablets, through to light bulbs, and CPAP machines – then a medium or lower capacity solar generator unit is going to give you the ability to get it done while also allowing you to recharge from a set of connected solar panels when needed. While you’re not going to be keeping all of the appliances in the kitchen running with a generator in this bracket, these units offer excellent value for money when it comes to a solution that’s lightweight and portable for powering up those smaller essentials when access to power is threatened. A lower capacity also equates to a lower physical footprint and solar generators in this range are ideally suited to situations where portability is a top consideration. If you’re thinking of assembling a solar power generating solution that can be moved at a moment’s notice, then these generators are a solid choice for moving quickly when needed and are the natural addition to a bug out vehicle loadout as well for use camping, or stored in the garage for home emergency use. This generator unit is an excellent choice if you’re looking for a lightweight and portable solar power plant that will keep small devices charged on the go. 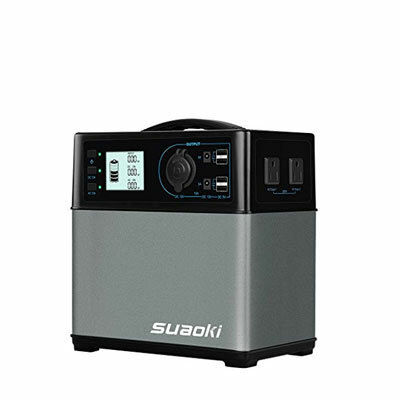 With an 11.1V, 20,000mAh / 3.7V, 60,000mAh capacity, the Suaoki generator has enough power to charge smartphones over 20 times as well as power banks, laptops, mini-refrigerators, tablets, and other small household electronics. Utilizing a high-density lithium-ion (Li-ion) battery means that the Suaoki is able to compact the size and weight to power ratio down from heavier lead-acid systems, while the device’s Battery Management System is specifically designed to prevent excess current, voltage, and temperatures, ultimately extending the life of the battery. In terms of output capabilities, this generator features 2 100V/110V AC outlets (200W Pure Sine Power Inverter), as well as 2 DC outlets, and 2 USB ports, all providing the ability to charge USB/5V, DC/12V, and AC appliances wherever and whenever needed. 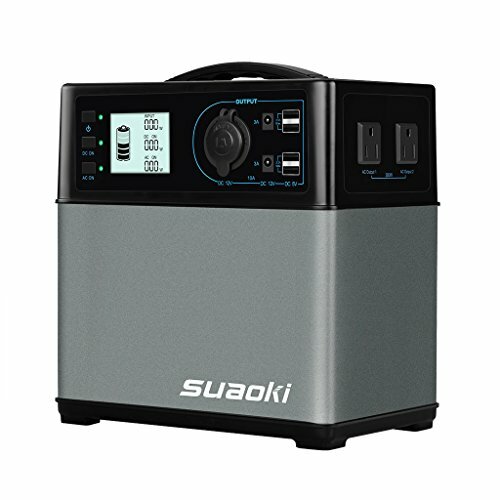 When it comes to recharging and getting energy into the unit, the Suaoki generator can be connected to compatible portable solar panels as well as directly from home wall outlets. When utilized as a solar generator, the 250 Watt Rockpals unit is a great choice for storing a source of emergency backup power from the sun. 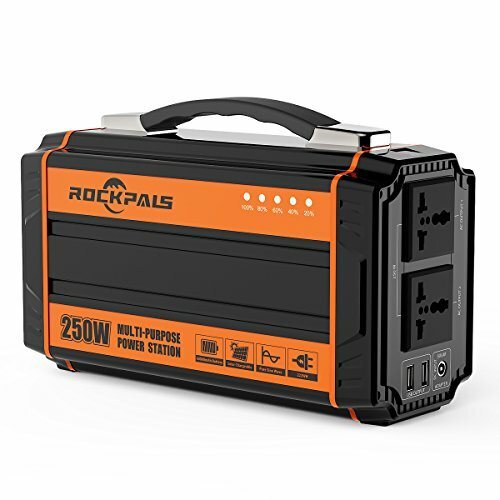 Based around a 222WH lithium polymer power pack, the Rockpals generator is both lightweight (coming in at just 5.5lbs) and highly efficient, making it one of the best solar generator base units when it comes to weight-output. This low weight design makes the Rockpals Portable Generator an awesome choice for use either at home as part of your home preparedness strategy, or when out on the road, paired up with a bug out vehicle loadout to provide a reliable source of backup power for devices ranging from cell phones and tablets, to laptops, fans, lights, and CPAP machines. When paired up with a compatible 50W or 100W solar panel, the battery pack within this solar generator unit is going will begin charging for use when needed. Alternatively, plugging the generator directly into the wall will see the battery pack charged in around 8 hours. The Explorer 240 is a lightweight portable generator that provides a ready source of power in a whole range of situations from vehicle or camping use through to providing a quick, lightweight, and reliable energy solution in a blackout or power outage at home. At the core of the Explorer 240, a lithium battery pack provides the power plant for the generator, providing a 240Wh capacity for keeping a range of devices in power and charged when needed. One of the major appeals of any generator within this class is portability and the Explorer 240 is the perfect example of this, coming in at just 6.6 lbs and measuring 8 x 5 inches. 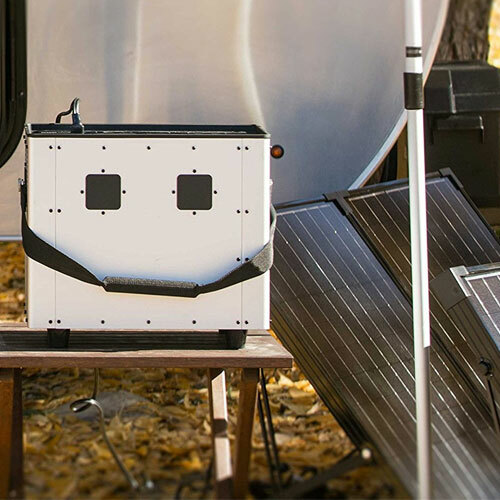 This low form factor means that if you’re looking to build a portable solar generator system that is easy to move and store, the Explore 240 is going to represent a solid choice for the power storage and output parts of the system. When it comes to getting the generator unit juiced up, the device includes a DC input and can be plugged into a wall power socket or of course, into a set of compatible solar panels at which point you can expect a full charge in around 7 to 10 hours. 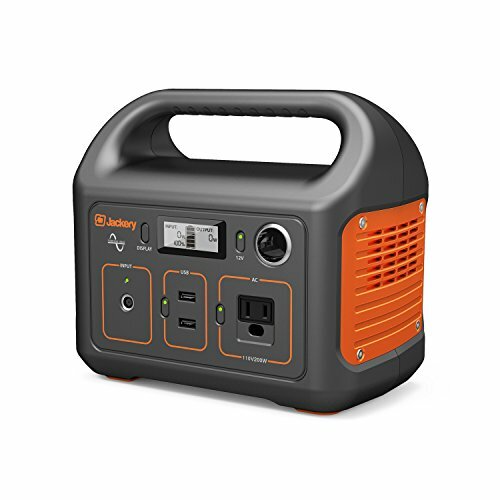 For hooking the generator up to your devices when power is needed, the Explorer 240 features 2 USB outputs, an AC outlet and a car port. 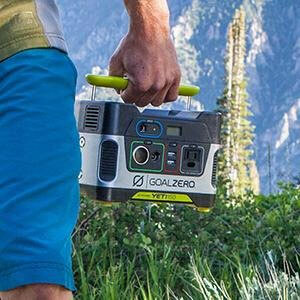 The Goal Zero Yeti 150 is a solid choice if you’re looking for a portable solar generator power unit that’s portable enough to take camping, while providing a good level of basic power supply for minor home emergency situations or power outages. With the ability to charge this solar polar plant from a vehicle’s power outlet as well as from the wall socket at home, and of course, through a connected array of solar panels, the Yeti 150 is a great solution if you’re searching for a solar power unit that can effortlessly move between uses wherever you need to use it. As part of a connected solar generator setup, the Yeti 150 provides the ability to store up to 168 watt hours of energy and is a good choice for meeting the energy requirements of smaller devices such as smartphones, cameras, tablets, and laptops. Depending on the method of charging, you can expect the Yeti 150 unit to charge from anywhere between 6 hours (via an AC wall outlet) and as quickly as 3 hours (when connected to an optimized solar panel arrangement). 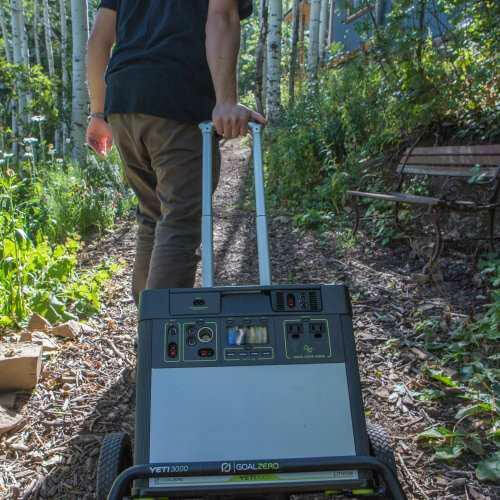 In terms of the physical factors, the Goal Zero Yeti 150 comes in at around 12 lbs of weight and features a carrying handle, both of which making the unit more portable and easier to move than larger generators. This smaller form factor makes the 150 perfectly suited as part of a solar generator system for use in a smaller vehicle packing load-out where the main requirement is to run smaller electrical devices in the field. Solar panels in this size range are substantial enough to deliver a good level of power to a portable solar generator unit while still remaining easily manageable when it comes to moving them from place to place. 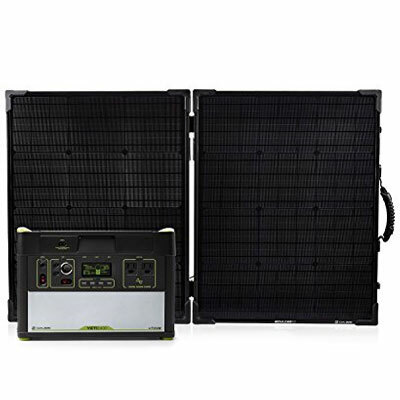 This kind of solar panel is therefore an excellent first choice when it comes to sourcing a solar panel solution for use in a home emergency preparedness situation, for including as part of a bug out vehicle packing list, or for keeping as an easily stored off-grid solar solution for use away from home. The high performance options within this category are not likely to be suitable for backpack use or for carrying long distances on foot (we’ve covered these in the section below), but are going to represent probably the primary choice for those looking for a solution that performs well, collects sunlight efficiently, and is designed to move around with you when required. The obvious advantage of foldable and ‘briefcase’ style solar panels is the portability they bring when it comes to moving around when needed. 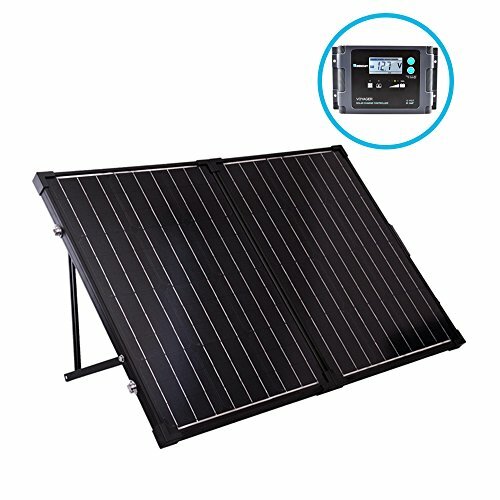 These types of solar panels provide a natural advantage when combining with a portable solar generator power unit and incorporating as the energy collection element of a solar generator system as they can quickly and easily be taken where needed as well as being simple to store when not in use. Being able to fold and carry your solar collecting panels alongside the same advantage offered by a companion solar power unit means you’re going to have an excellent and potentially high power solution that delivers enough energy to meet your needs in a home preparedness situation, with the flexibility and portability to bring along in a vehicle if you’re intending to evacuate or go off grid. With many of these kinds of portable solar generator panel systems designed to work with high performance power plants, you’re looking at a combined solution that will capture, store, and output enough energy to run larger appliances in your home as well as keeping you supplied with energy when you’re in remote locations. Formed from two panels which fold up into a briefcase style kit with carrying handle, the Boulder 200 is highly portable and flexible enough for any eventuality meaning it can be used as either a static panel system (using mounting brackets for installation) or taken with you and moved around as and when needed. As the name suggests, durability is built into the very structure of the Boulder 200 and the unit utilizes a construction of rigid, anodized aluminum and tempered glass to deal with anything that comes it’s way from the moment you’ve set it up. 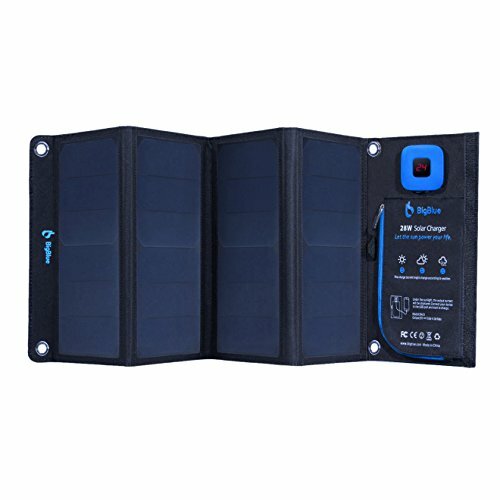 Delivering a total of 200 watts through its highly-efficient monocrystalline solar cells, the Boulder 200 uses a briefcase style foldable form that means it can quite literally be folded up and carried wherever you need it if the situation changes or you find a better spot to capture sunlight. 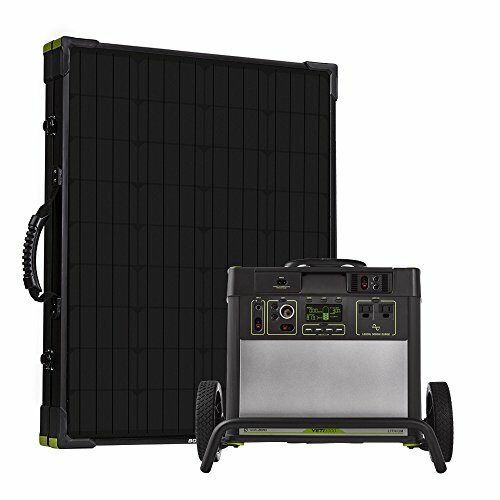 Combine this portability with a rigid aluminum frame that delivers a combination of strength and lightweight, and you’ve quickly got a portable solar generator panel system that’s perfectly suited for taking in vehicle for camping, emergency, or off-grid scenarios, as well as for calling on at home in an emergency situation. 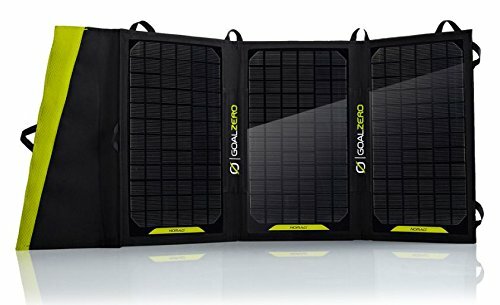 The Boulder 200 Briefcase solar panel is designed in a way that means it can also be linked up with other compatible solar panels to cut down on solar recharge times, allowing you to form an array which cuts down on total charging times. This portable 100 Watt solar panel is designed to allow you to capture solar energy whether you’re at home or off grid. The Renogy 100W Solar Suitcase offers excellent performance in low light conditions and is comprised of two 50W Monocrystalline Solar Panels, a 20A waterproof charge controller, connection cables, and a protective soft case for portability. 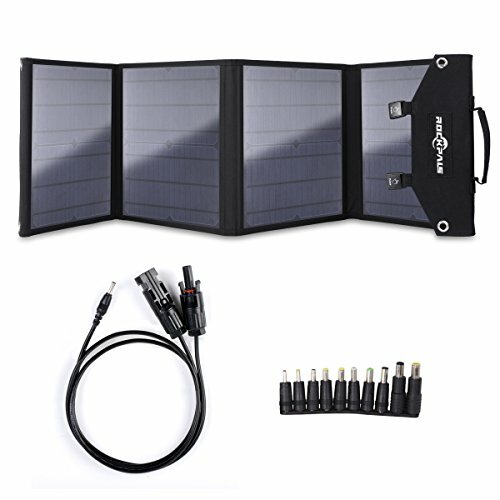 One of the major advantages of this solar panel kit is the inclusion of 20A Voyager waterproof charge controller which can be used to charge up to 7 different types of battery including lithium ion, this charger is going to deliver a safe and stable charge to any batteries whether gel, sealed, or flooded. An adjustable corrosion resistant aluminum stand, locking latches, and a heavy duty handle are designed to provide lightweight strength to the system, making it easy to move, resilient in challenging conditions, and ultimately offering portability and durability. 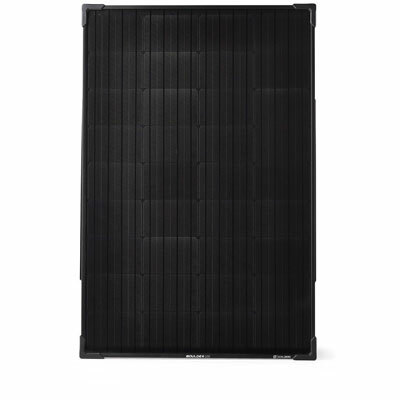 The Renogy 100W Solar Suitcase is designed to work alongside an extended array of panels meaning you can expand to match your available space, maximizing your solar collection coverage. The foldable solar panel system from Rockpals is designed to be used as part of a solar generator system and offers a ton of compatibility with the best solar generators on the market. 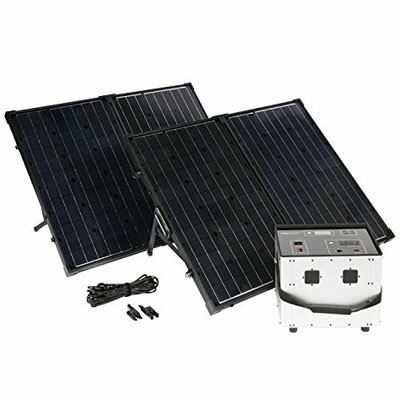 With this in mind, this solar panel set comes complete with adapters for Suaoki, Goal Zero, and Paxcess solar generators and portable generator systems. The Rockpals 60W Solar Panel Charger also includes connectors for 5V USB devices and can be used to charge smartphones, tablets, GPS, and other similar devices. A high level of solar efficiency is built into the Rockpals panels, allowing the array to convert up to 21.5-23.5% of captured solar energy into usable power. In terms of durbility, these solar generator panels are designed for outdoor use, offering a level of water resistance which makes them perfectly suited for use either at home or in backcountry conditions. Similarly, the foldable design of the panels makes them highly portable, reducing to a folded footprint of just 10.6 x 13.8 x 1.8 inches – perfect for inclusion in a larger bug out bag loadout or packed in a vehicle. Backpack and portable solar panels come in a couple of varieties ranging from pocket sized powerbanks for small devices and cellphone charging, to larger, foldable solutions that will keep mid-size devices powered while still remaining small enough to carry on your back when packed down. With these compact solar panel systems you’re generally going to be looking at the ability to charge smaller electronics devices such as cellphones, lanterns and lights, and equipment such as tablets or laptops. 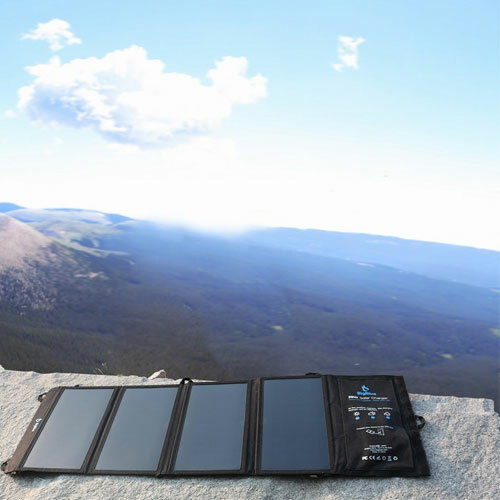 These solar panel systems are therefore a great option if you’re looking for the best lightweight emergency solar charging system for a device such as a high performance tactical flashlight, allowing you to recharge in the day for use when it gets dark. As with anything else in the world of preparedness planning, when it comes to finding the best lightweight solar panel system for carrying with a bag or backpack, or in a vehicle, you’re looking to strike the perfect balance between performance and physical considerations such as size and weight. It’s ultimately those devices that fall right in the middle of these criteria that will offer you the optimal solution when it comes to a solar charging system for inclusion in a bug out bag or vehicle, or as your power source in a hiking or backcountry loadout, and it’s those solutions that we’ve gathered together in this section of the guide. A foldable and lightweight solution is the essential factor when it comes to finding the best solar panel for use with a backpack or carrying on foot. The best backpack solar panels and backpack solar generator systems need to combine ultimate efficiency (how effectively are the panels able to capture sunlight?) with a form factor that’s compact and light enough when packed up to carry in or on a backpack or bag. We’ve taken a look at the best lightweight and foldable solar panels in this part of the guide to help you find the top backpack solar panels for keeping your small devices powered up wherever you find yourself. The Nomad 20 is a natural choice if you’re looking for a compact and foldable emergency solar panel solution that you can carry with you as part of a backpack or vehicle based packing list. 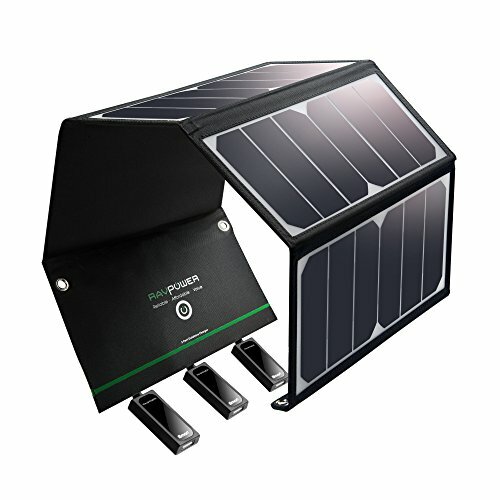 Featuring a foldable, rugged, and weather resistant design, the Nomad 20 is able to collect 20 watts of solar power from the sun which can then be stored in a power pack for later use when needed, or used there and then by connecting directly to multiple devices. Utilizing a built-in junction box with a smart-charging chip means you can power a portable USB or 12 Volt based devices using the power of the sun. A foldable and portable design makes the Nomad 20 a great choice for using anywhere – simply unpack, unfold, and plug in. This compact and foldable solar panel weighs in at just under 21 ounces yet provides a level of durability and performance you’d expect from similar devices within this category weighing (and costing) twice as much. One of the major benefits of the BigBlue is the presence of a built-in ammeter and chip combination which allows you to see the amount of Amps present while ensuring a balanced and stable charge is delivered to any connected devices. While not in use, an IPX4 water resistance rating means that this panel is going to cope with adverse weather conditions such as light rain and fog thanks to the construction of the solar panel surface which utilizes a special PET polymer. This portable solar generator is small enough to carry anywhere while designed to deliver an increased charging efficiency of up to 21.5% – 23.5% extra. 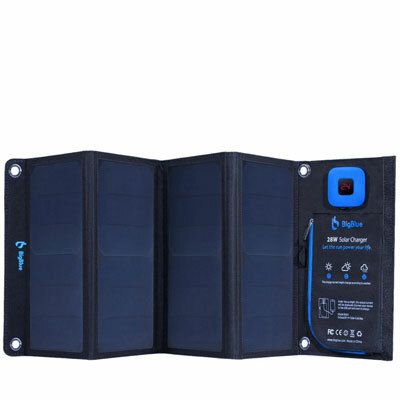 Utilizing a lightweight design, the RAVPower 24W Portable Solar Charger also features what the brand calls ‘iSmart technology’, a system which automatically delivers the optimal charging output based on the devices connected via 3 USB ports built into the system. The compact form factor of this backpack solar generator makes it the ideal addition to a bug out backpack, with a design that’s perfectly suited for either stowing within your bag or attaching to the exterior in charging mode, meaning you can charge devices while on the move. If you’re looking for the perfect portable solar generator solution for charging small devices on the move, the RAVPower 24W Portable Solar Generator delivers a lightweight way to get it done. As you’ve probably guessed from the name, the best emergency powerbanks provide the ability to store and call upon a portable source of power when you need it most. The key features that distinguish an emergency preparedness powerbank from some of the other portable power storage solutions out there are subtle but critically important, so much so, that just by neglecting one of these features, there’s a very real risk that in a ‘live-fire’ scenario, the power pack may fail when needed most. The primary considerations around an emergency preparedness powerbank are almost without exception around the durability, weight, and performance of the device during challenging situations and adverse conditions. We’re talking about things like in-built water resistance capabilities, rugged (and lightweight) construction materials, and of course, the ability to hold a significant charge and deliver it to your devices whenever you call on it, no matter what’s unfolding in the world around you. Basically, the best emergency preparedness powerbanks need to be as prepared to react and perform during an emergency situation as you do, and it’s the highest performing of these devices which we’ve gathered in our roundup below. 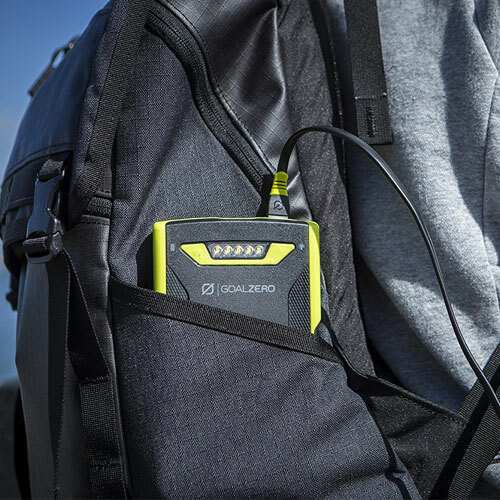 Whether you’re caught in a downpour, or safe and dry in a tent or at home, the Venture 70 is a pocket-sized power bank that’s built for keeping your small devices powered up in tough and unpredictable conditions. With a weather and water resistance of IPX67, this pocket power storage solution is highly resistant to water when in use, meaning it can take a drenching without any effects on the ability of the device to perform and do what it needs to in charging your devices. The Venture 70 utilizes smart charging technology with the inclusion of two USB ports which are capable of dishing out 2.4A simultaneously which means you’re going to have a dual high output solution for small devices that run out of power on the go. 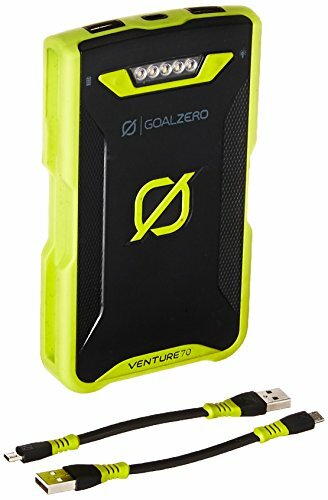 Providing the ability to power up to 6 phones or 2 tablets, this 17,700 mAh power pack is incredibly lightweight and packable, making it the ideal emergency power solution for slipping into a pocket or bag for use in any number of situations ranging from casual travel through to real-world survival situations at home or in the field. The Venture 70 comes in two main versions, a Micro USB to USB variant (pictured) and an Apple device friendly Lightning/Micro version which includes both a Lightning to USB cable and a Micro USB to USB cable. From tablets and flashlights to headlamps and cellphones, this waterproof powerbank is a natural choice if you need a portable all-weather energy storage solution that’s light and durable enough for almost anything nature can throw at it. As with every investment you make (particularly in one that your survival may one day depend on), you’re going to want to make sure you understand the fundamental aspects of solar generators in order to ensure you’re able to find the best solar power system for the job. From getting to grips with the most commonly used terminology to knowing the device specific considerations to look out for, finding the best solar generator for your specific situation means taking a look at a variety of angles to pick the perfect solar solution. In this part of our guide to the best solar generators, we’ve broken down the main things to watch out for when choosing a portable or emergency solar power system to make sure that the device you pick is suitable for the needs of you and your family. When it comes to finding the best solar generator for your specific requirements, probably the most important factor you want to be looking for is the storage capacity of the battery. It’s this criteria that will determine how long you’re going to be able to draw power from the unit when you use the generator system. Whether you’re drawing power at night time, the weather takes a turn for the worse, or the amount of energy you need (when plugged directly into the generator) exceeds what the solar panels are bringing in, it’s the storage capacity of the battery that will matter most in each case, as it’s this that will be drawn upon during these instances. There are a couple of major types of battery which are typically included with the best portable solar generators, and generally you’re going to be looking at either lead-acid or lithium batteries when it comes to finding a device suitable for your needs in a home preparedness or emergency backup power scenario. The common agreement here is that with lead-acid batteries you’re going to only want to use 2/3 of the batteries full capacity (i.e. only draining down to about 30-35% from a full charge – not to 0%). The reason for this is to preserve the life of the battery and reduce the likelihood of the battery failing when you need it most one day. Lithium batteries on the other hand are considerably more efficient in this respect and around 90% of the capacity can be used meaning you can run the unit down to around 10% from a full charge before you’ll want to recharge again. Given the increased efficiency of lithium batteries, alongside the considerable reduction in weight, these are increasingly the most common type of solar battery that companies offer and the once high price point of this kind of battery is now highly competitive. When it comes down to defining the capacity of moat power units in a solar generator system, you’re going to come across the term ‘Watt Hour’ or ‘Wh’ fairly regularly. At its most simple, a Watt Hour is a unit of measurement for power over an hour, and is used in this context as a way of measuring capacity – a Watt hour is literally equal to one Watt of average power flow over the space of an hour. One Watt over three hours would be three Watt hours (3Wh) of power. So for example, you’d be looking at a 100 Watt device that you power from a 600 Watt hour generator or battery unit to last for around 6 hours. This is almost certainly one of the first things to consider when settling on a solar generation system for your needs and will be determined by how (and where) you’re planning to use it. Larger panels are almost without exception going to mean a greater ability to capture sunlight/energy and likewise, larger (and heavier) power units will likely correspond to a greater storage capacity. Note – An important thing to remember regarding the power/battery unit weight is that Lead based batteries will be heavier than their lighter Lithium-based counterparts. Similarly, you’re going to see a proportionally greater storage capacity:unit weight return with lithium batteries but the trade-off is that you should expect to pay more for this advantage over the cheaper but heavier lead battery systems. Do you need a solar system that’s small and light enough to carry in a vehicle? Does it need to be even more portable than this – compact enough to pack in a bag or backpack for example? Is this a solar generator solely for use at home without needing to be moved around? What kinds of devices and how many in total do you need to power from the generator? How long do you need to run any connected devices/appliances from your solar generator battery? Coming up with the answers to these questions will inform not only the power output and storage capacity of the solar generator you choose, but will also dictate things like the size of the panels and of the power unit itself which will directly correlate with your requirements. There are any number of instances in which you could find yourself without access to power and whether it’s a man-made event, natural disaster, or simply being somewhere without reliable (or any) connectivity to the grid, having access to a portable solar generator can make all the difference. If you’ve ever been in a serious storm at home, you’ll probably know only too well, the effect that serious adverse weather conditions can have on the energy supply. In major storm situations such as hurricanes, tornadoes, and blizzards, as well as in other natural disaster scenarios such as major earthquakes, downed power lines and serious disruption to the flow of electricity across the network aren’t just a possibility, they’re highly likely. You may not even need to be directly in the line of fire of this kind of event to get hit with the adverse effects it can bring. A severe weather event hundreds of miles away from home can bring about a chain of disruption that has a knock on effect where you live. Some of the most likely and serious situations in which the power could unexpectedly be cut relate to man made causes or events. In these cases, you could be looking at something as routine as a power cut which leaves you without electricity for a number of hours, to a hostile cyber attack from a third party that intentionally brings down the grid – potentially cutting the flow of power to your home for days at a time. On top of this, physical damage to energy infrastructure such as plants or power lines as the result of sabotage, conflict damage, or terrorism can leave those unprepared in the dark for a prolonged period of time. So long as your portable solar generator system is adequately protected in such an event (or if you’re far enough away from the source), an Electromagnetic Pulse or EMP event is a very real risk that can be effectively mitigated by bringing a solar generator into action if the grid is brought down and you find yourself suddenly without power. These kinds of events can be brought about in a few ways, but the most likely causes will almost be due to some kind of extra-terrestrial activity such as a solar flare, or as the result of a nuclear detonation which will almost certainly cause a pulse capable of bringing down large areas of electrical infrastructure. If you’re in a situation and area where the access to power simply doesn’t exist, if you want to be able to draw on electricity, you’re going to need to bring your own supply. There are any number of cases where this could be a likelihood, from a simple camping trip in the wildereness with the family, through to a bug out scenario where you end up heading to a remote location which maybe doesn’t benefit from the usual utilities. In an off-grid scenario, having a portable and reliable source of storable energy that simply relies on access to the sun is arguably the ideal solution for ensuring mobile energy security, not requiring you to invest in, carry, and store spare gas as would be the case with more traditional generator systems. Because of this, some of the best solar generators are perfectly suited for use in RV or vehicle loadouts, or kept at a pre-determined off-grid location for assembly and use when needed. Whatever the cause, being able to draw on your own source of pre-stored or easily captured natural energy from a backup solar generator system will mean that you’re able to quickly adapt and adjust at the flick of a switch if and when the lights go out. With all of our guides, we reference as many expert sources, real world user opinions, and verified reviews as possible so we’re able to provide the most relevant and educational information on finding the best solar generator for every situation. Choosing the best solar generator kit is never a one-size-fits-all activity with individual budget, specific requirements, and personal preferences sometimes varying considerably between people, locations, and uses. With these considerations in mind, this guide looks to provide advice on our own opinions of the best solar generator kits and solar panels available today, however, it’s always important to carry out your own due diligence to find the best solution for you when deciding on a portable solar generator solution that’s perfect for your situation.